May 29, 2015 March 31, 2019 - The 'Noms. 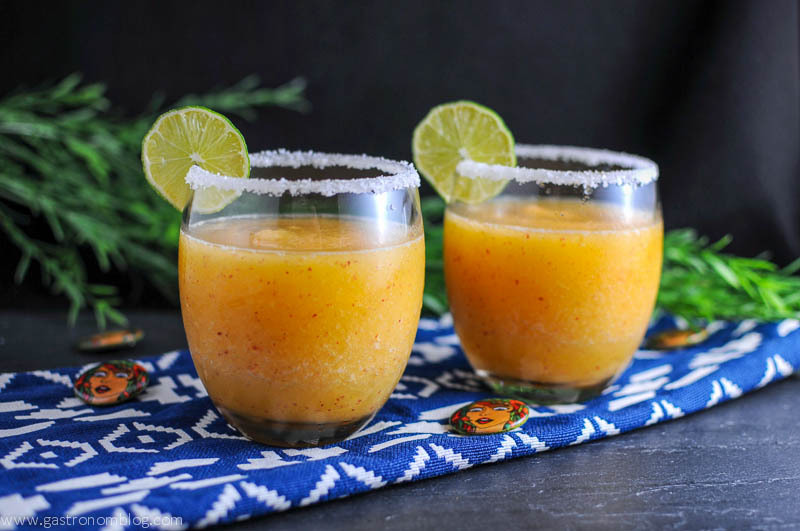 A Spicy Peach Margarita, this frozen margarita one is a great combo of sweet and heat! A good cocktail is a study in melding contrasting flavors into a combination that pleases your senses. One of the most fun flavor combinations is taking sweet and heat and letting those two flavors play off of each other. 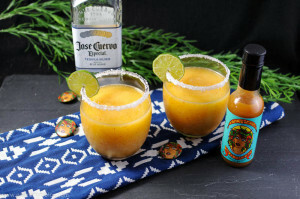 This cocktail takes the sweetness of fresh peaches and pairs it up with some serious heat from a hot sauce made with datil peppers into a frozen peach margarita by our friends over at Crazy Gringa Hot Sauce. We recently stopped by their booth at the Omaha Farmer’s market and they mentioned that they were big fans of of our cocktails but had one that they thought would be right up our alley. We got a bottle of their Peach Datil Pepper hot sauce and their secret Datil Peach Margarita recipe! 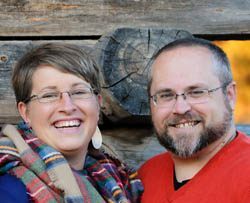 Crazy Gringa Hot Sauce is a family owned and operated business that started in 2011 when the Gringa, aka Mary Currant, had a huge harvest of spicy habanero peppers. Needing something to do with the peppers, she whipped up a batch of hot sauce that was a hit with her family and friends. 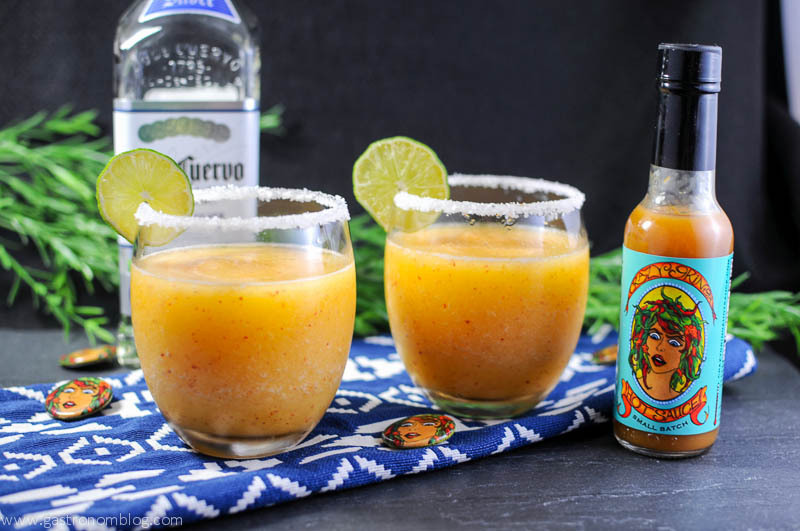 Made start to finish by the family in Omaha, they have expanded into four different sauces plus a number of special limited edition sauces, one of which is the peach datil pepper hot sauce used in this frozen margarita. 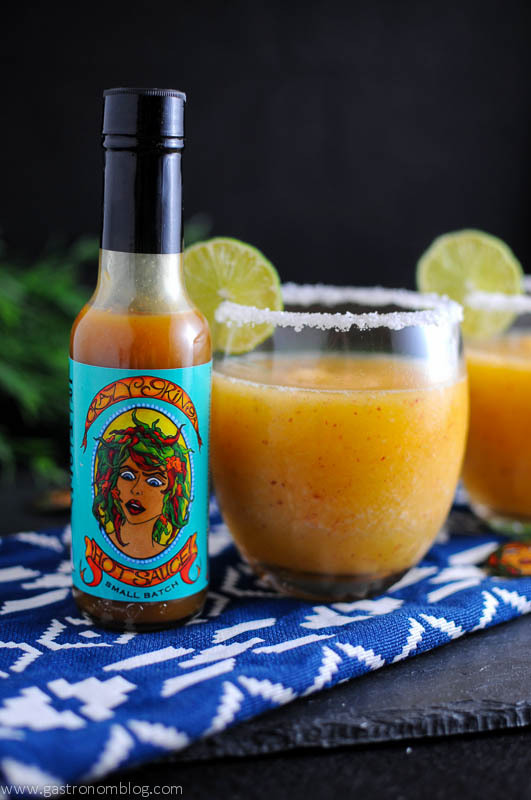 Having the chance to use a great local product in one of our recipes is always exciting to us and when the folks at Crazy Gringa gave us a bottle to play with, we jumped at the chance to partner with them. Make sure you stop by their booth at the Omaha Farmer’s Market or hit up their website and let them know that we sent you! 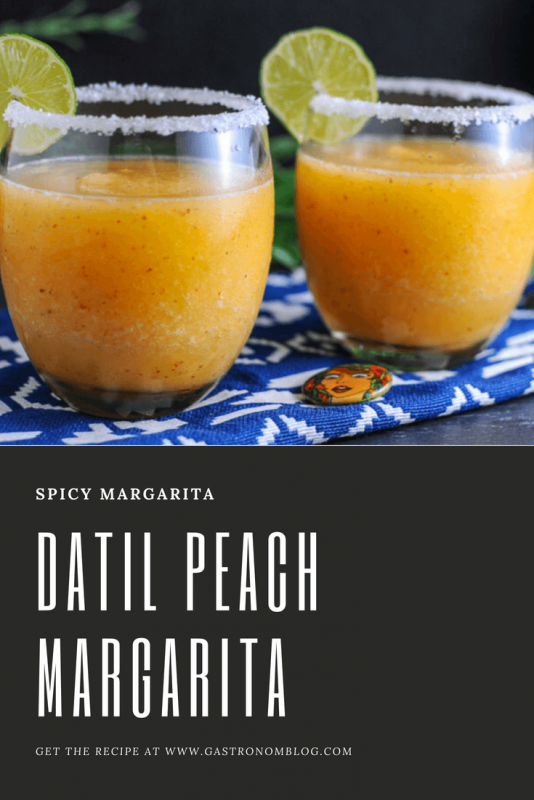 What Ingredients are Needed for the Datil Peach Margarita? While the hot sauce by itself is quite spicy, when paired up with the sweet peaches and tart lime, the heat is tempered into a pleasant slow burn. 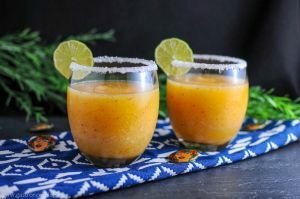 The blended fresh peaches provide a great color and the salty sweet rim really brings out the flavors in the drink. 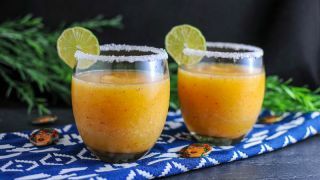 A sweet and spicy margarita, that we used peach hot sauce in! If you have a rimmer for the glasses, add half salt and half sugar, if not, just use a plate and rim your glasses. 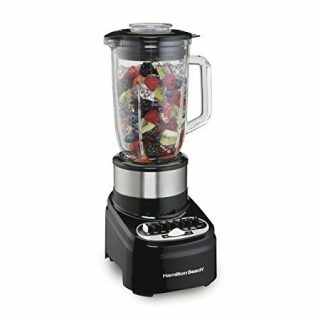 Combine the rest of the ingredients in the blender and blend them. Pour the mixture in the glasses, garnish with a lime wheel if desired. 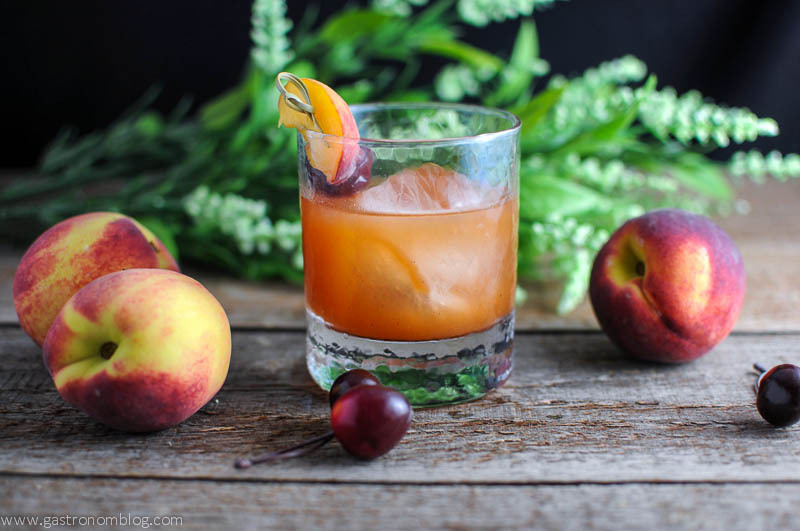 PIN THIS PEACH MARGARITA RECIPE FOR LATER! 10 Reasons to Love the Omaha Farmer’s Market! Cool. The fresh peaches sounds perfect for this. It was! The sweet/spicy mix was great! Love the local love! I am so intrigued by a spicy margarita. Thanks! It was really tasty, the sweet peaches made it a perfect offset to the spice! 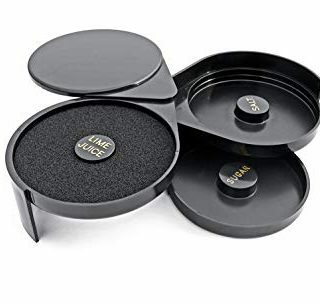 It would be a great cooler for a warm day! 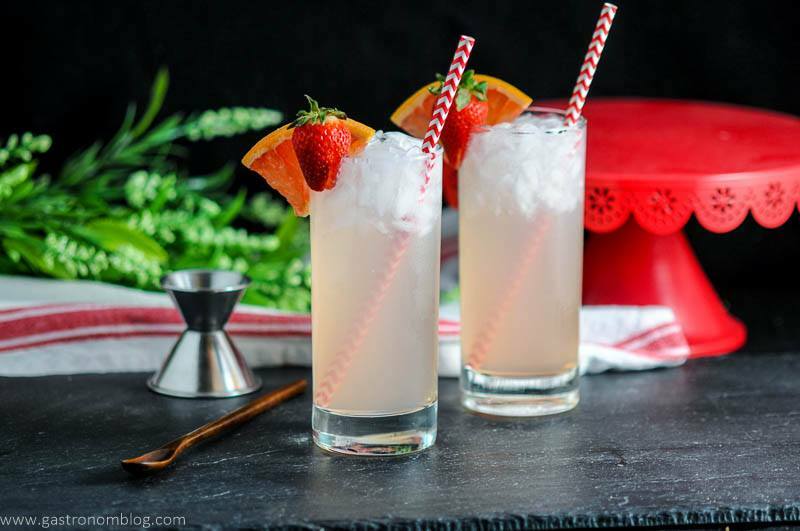 yum this is the perfect summer drink! This looks so amazing! I can’t wait until I’m able to have a cocktail again! I absolutely love margaritas and spicy things so this is perfect! Thanks! Hope you keep it on your list for later! It is so good, as are their other flavors! We adore our Farmer’s Market for a lot of reasons! We love to use fresh veggies and fruits in drinks too! It would be perfect for that!